A relaxed soirée with wine and nibbles provided. We will chat about the book and how much (or little!) we enjoyed it. Led by Kate Fulton, Belinda Mindell and Fiona Seitler. Book Soiree 20th February at 8pm in the Small Deal Hall. We will be reading and talking about the book by Wendy Mitchell called 'Somebody I used to Know'. "Brave, illuminating and inspiring, Somebody I Used to Know gets to the very heart of what it means to be human. What do you lose when you lose your memories? What do you value when this loss re-frames how you've lived, and how you will live in the future? How do you conceive of love when you can no longer recognise those who are supposed to mean the most to you? 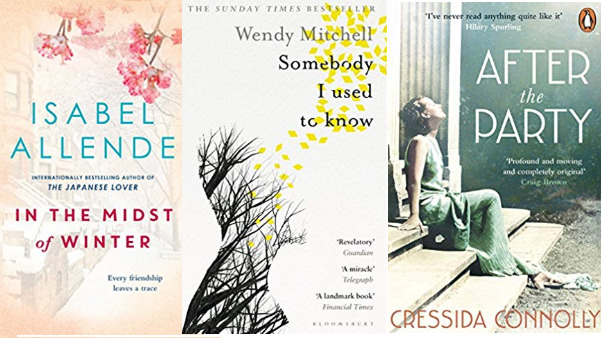 Philosophical, profoundly moving, insightful and ultimately full of hope, Somebody I Used to Know is both a heart-rending tribute to the woman Wendy once was, and a brave affirmation of the woman dementia has seen her become." We will talk about the book and we have some specialists in the field who will be coming along too. Vivienne Gould, Consultant Old-Age Psychiatrist, Rebecca Corney, Counselling Psychologist specialising in working with older people and their families and Rachelle Lazarus from Jewish Care, who can advise about living support for those with dementia. The evening will be one where you can come and talk about the book, ask questions of our experts and share your own experiences, thoughts or concerns. So, read the book, and call or text Kate Fulton on 07801 911 481 to reserve a place. ‘After the Party’ by Cressida Connolly features a good yarn taking us from Mosley’s Anti-Semitism, sisterhood and a spell in Holloway prison - a thought provoking novel. Please contact Kate Fulton on either 07801 911 481 or click here to email if you would like to offer to lead/ host a future book soirée.